Nothing momentous happening here. The cousins arrived yesterday, they all wore each other out and slept late. While I was inspecting the grounds this morning, however, I found a cool picture to take. Don't click it if you're bug-averse. 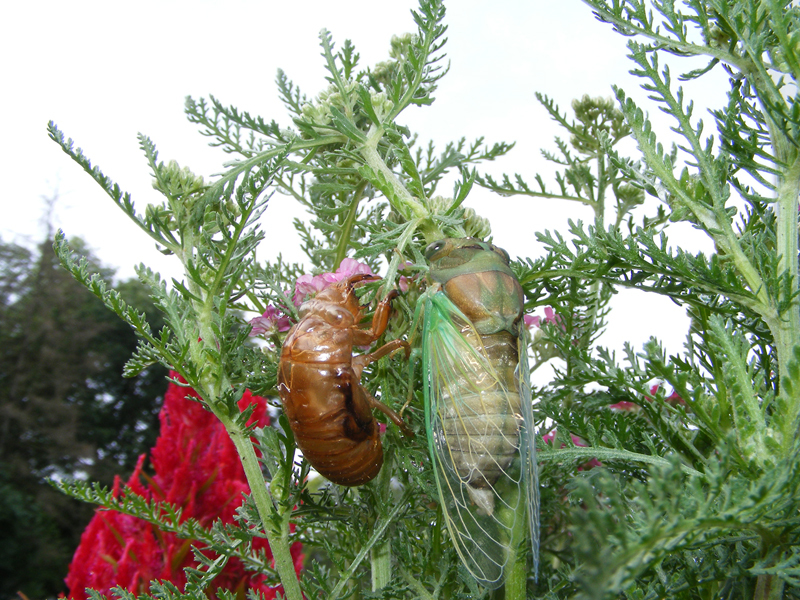 I remember a couple years before I moved from MD to FL, we had a 13yr and a 17yr generation of cicadas emerge at the same time. The racket was incessant! And the darned things were EVERYWHERE. They were restriping the parking lot behind my building at Goddard, and a bunch of cicadas got painted under. It's a great insect photo, but the story is what hit me. Makes me think of superman next to his phone booth ... or switching the kid into the next size of shoes (old shoes limp, dirty and discarded).